You’ve seen this box, the Dishpack box. Many people are confused by its large size. They ask, when it’s packed with dishes, won’t it be too heavy? The dishpack box has a different strategy than the smaller boxes you have seen. The smaller boxes can be hand-carried a ways. The dishpack box is designed for very minimal hand-carrying or lifting. It is designed to be rolled on a box hand-truck from the kitchen to the truck, and then maybe only lifted on top of another dishpack box when it is placed into a tier on the truck. The real identifying characteristic of the dishpack box is its thickness. Its cardboard is double-thick. When packing fragile kitchen items in this box—properly and with lots of newsprint and bubble-wrap, it is almost impossible to break them. In fifteen years of moving, I’ve experienced all types of claims, but we have never had a claim for a broken dish or glass which we packed in a dishpack box. 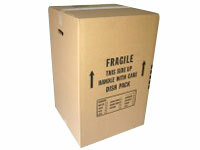 If your clients want to learn more about dishpack boxes, or how we can make their moves easier, have them call us. This entry was posted in Box-Packing and tagged Claims, Dishpack Box by Bob McGregor. Bookmark the permalink.